Note: Kettlebell weight is up to 53lb. for men and 35lb. for women. The clock begins with the start of the Concept 2 Row, and concludes upon finishing the 400 Meter Run. This is a great workout! Congratulations to Cobbie who was recognized as Athlete Of The Week at CrossFit Amundson. Cobbie exemplifies the character values of service, kindness, faith, warrior-spirit and determination. Her performance in workouts and physical-challenges is a huge source of inspiration to everyone who knows her. 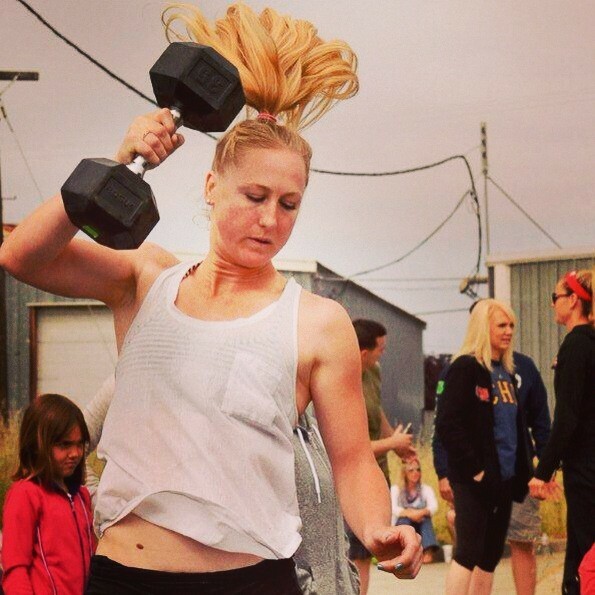 Cobbie competed in a CrossFit Competition at Hayward Police Department (see photo above), where her leadership and physical capacity helped her team to a strong finish. In addition, during the recent SWAT “Murph” competition, Cobbie took 3rd place in her division with St. Lucie County SWAT Team in Florida, completing “Murph” in an incredible 37:15. Her time on “Murph” secured her a top-10 finish among SWAT Teams across the Nation, and the fastest overall female time. Shortly after completing “Murph” in Florida, Cobbie was presented the official SWAT Team Challenge Coin by SWAT Commander Brian Hester for her performance, inspiration and warrior-ethos. When not in Santa Cruz, Cobbie trains with Mark Divine at SEALFIT in Encinitas, and serves as a Peace Officer in Southern California, with a goal of becoming a SWAT Operator on her Department’s SWAT Team. Cobbie’s mom Diane, the Chief of Police at Hayward Police Department, is competing in the CrossFit Games Masters Division in Carson City. Congratulations Cobbie on all your success, both inside and outside the gym! Today our Light class will join our HQ class with slight WOD modifications.